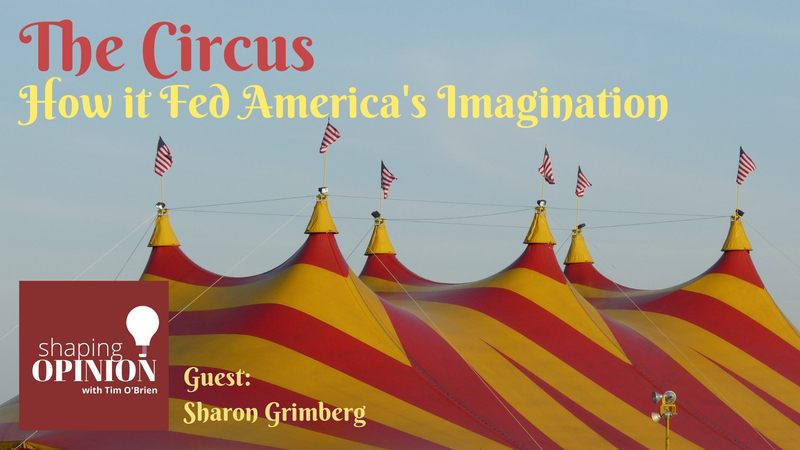 Sharon Grimberg served as a writer, producer and director on the American Experience production of “The Circus,” which premieres on October 8th on PBS stations. The two-part series takes us inside America’s most dominant form of entertainment from its roots, to its glory days with the greatest showman, P.T. 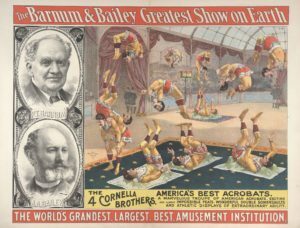 Barnum, James Bailey and the Ringling Brothers, all five of them. 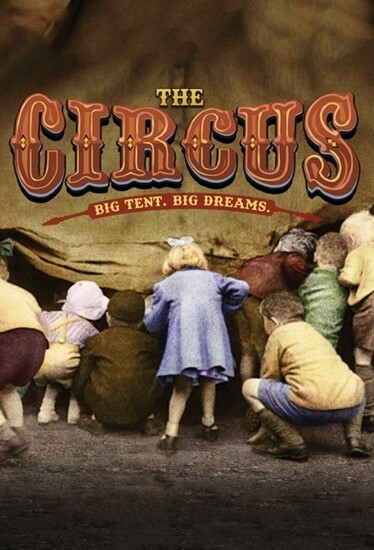 “The Circus,” a four-hour, two-part documentary, explores the colorful history of this popular, influential and distinctly American form of entertainment, from the first one-ring show at the end of the 18th century to 1956, when the Ringling Bros. and Barnum & Bailey big top was pulled down for the last time. A transformative place for reinvention, where young women could become lion tamers and young men traveled the world as roustabouts, the circus allowed people to be liberated from the roles assigned by society and find an accepting community that had eluded them elsewhere. Drawing upon a vast and richly visual archive, and featuring a host of performers, historians and aficionados, “The Circus” brings to life an era when Circus Day would shut down a town, its stars were among the most famous people in the country, and multitudes gathered to see the improbable and the impossible, the exotic and the spectacular. Through the intertwined stories of several of the most innovative and influential impresarios of the late 19th century, including P.T. Barnum, James Bailey and the five Ringling Brothers, Sharon talks about how the series reveals the circus as a phenomenon created by a rapidly expanding and increasingly industrialized nation. It explores how its “dangerous” and “exotic” attractions revealed the country’s notions about race and Western dominance, and shows how the circus subverted prevailing standards of “respectability” with its unconventional, titillating and “freakish” entertainments. For more than a century, Circus Day was as anticipated as Christmas and the Fourth of July. It would crash into everyday life, colorful and brash, and then disappear, leaving many dreaming of another life. As the country grew, so did the circus, evolving into a gargantuan entertainment that would unite a far-flung nation of disconnected communities and dazzle not only Americans, but the world. The first circus in the U.S. was established in Philadelphia in 1793, but it wasn’t until the introduction of the tent in 1825 that the circus became a truly roving art form that could reach the tiniest hamlets. Almost everywhere, the circus met the disapproval of the religious and puritanical. In a society that valued sobriety and hard work, a wide-eyed day peering at half-naked aerialists amid shifty circus workers was frowned upon. Soon, circuses began to add elaborate menageries of exotic animals including lions, hippos and elephants, and “human oddities” from across the globe — rebranding themselves as “educational” experiences to concerned communities. The arrival of infamous showman and huckster P. T. Barnum transformed the trade. In 1871, Barnum and his partners created the largest touring show in existence. 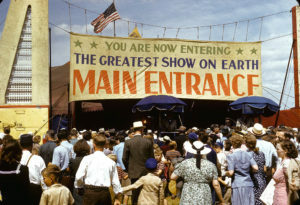 In a few short years, they added a second ring to the big top and began touring by train, turning the circus into a complex, industrialized organization. A master of publicity, Barnum promoted his shows with ever more elaborate marketing campaigns. Other circuses followed suit, but Barnum met his match in two outstanding rivals: a former Philadelphia butcher named Adam Forepaugh, who countered every one of Barnum’s claims with outlandish hyperbole of his own, and James Bailey, who ran away to the circus at age 13 and soon owned his own show. In 1876, Bailey would take that circus — animal menagerie, performers, tents and all — on a 76,000-mile tour around the world. Barnum soon realized he would do better with Bailey as a partner than as a nemesis, and in a wild publicity stunt involving a baby elephant, the two men made much of their merger. In Baraboo, Wisconsin, five sons of an impoverished immigrant harness-maker launched their own one-ring circus. In just a few years, the Ringling boys from Baraboo had turned their show into a force with which to be reckoned. Bailey returned to the U. S. in 1903 and died three years later. Soon after, the Ringling brothers bought Barnum & Bailey. For a while, they ran the two shows separately, but, in 1918, after several tough seasons during World War I, the brothers combined their circuses into one mammoth outfit: the Ringling Bros. and Barnum & Bailey Circus, a moving town of more than 1100 people, 735 horses, nearly 1000 other animals and 28 tents. Featured were some of the most storied circus performers in history, including the famed aerialist Lillian Leitzel; May Worth, who stunned audiences by somersaulting on horseback; and big cat trainer Mabel Stark. The Ringling Bros. and Barnum & Bailey Circus limped through the Great Depression, facing new competition from radio, sporting events and the movies. After the death of John Ringling, the last surviving brother, his nephew, John North, took over. North’s vision of a modernized circus that borrowed from the aesthetic of Broadway and Hollywood revived the circus for a while, but a catastrophic fire in 1944 made the operation of a massive traveling tented show unviable. In 1956, North folded before the end of the season, announcing that his traveling circus would never again perform under a big top. For more than a century, the circus had brought daily life to a standstill. Shows took over rail yards. Parades clogged Main Street. Acres of billowing canvas appeared mirage-like on the outskirts of town. And then, when day broke, the miracle had vanished. Equestrians, sideshow performers, clowns, roustabouts, an enormous collection of curious beasts — all became just figments of a glorious dream. Sharon Grimberg has more than 20 years of experience working for public television. Grimberg was the executive producer of the three-part series The Abolitionists, which was nominated for a Primetime Emmy and a Writers Guild Award. Grimberg was also executive producer of the multi-platform mini-series We Shall Remain, and a producer/writer on the first episode, After the Mayflower. Grimberg served as the supervising producer of They Made America, a series on innovation based on award-winning writer Sir Harold Evans’s book of the same title. 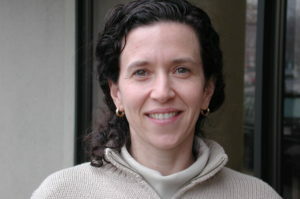 As senior producer of AMERICAN EXPERIENCE for more than a decade, she played a key role in the origination, development, acquisition, and editorial oversight of more than 130 films for the series. 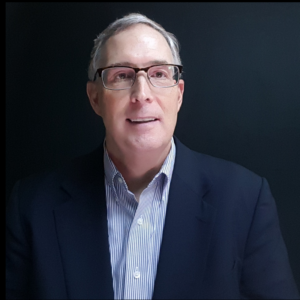 From 1992-1995 Grimberg worked as a writer and associate producer for CNN Headline News.